Serve with fresh vegetables, salad or Polish refrigerator pickles. 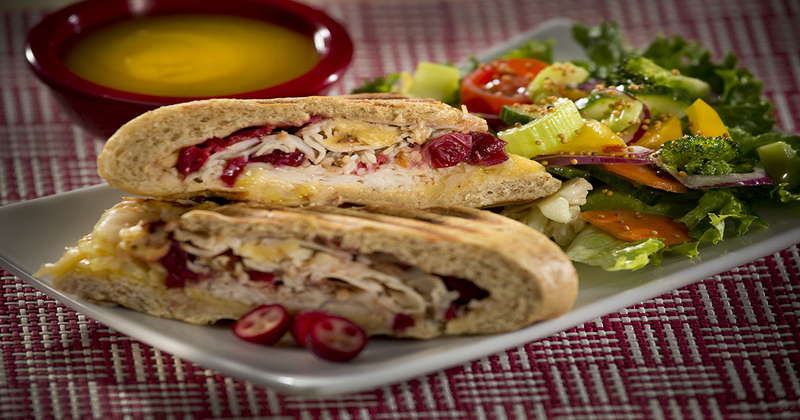 In microwave-safe container combine cranberries, mustard, onion, vinegar and sugar. Mix well. Cook at 100% power for 1 1/2 minutes. Stir, cook another 1/2 minute, stir. Lay flatbread on countertop, drizzle 1/2 tsp oil over each. With fingers, spread oil over bread. Flip bread over, put 1/4 of the cheese over half of each bread. Divide turkey between the two flatbreads on top of cheese. 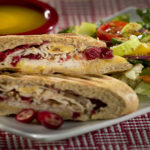 Divide and spread cranberry butter over turkey. Sprinkle pepper over sandwiches to taste. Top with remaining cheese. Fold flatbread over to cover toppings. Grill at 325°F for 3 minutes in a panini maker until cheese is melted. Cut in half crosswise. A non-stick fry pan heated over medium heat can also be used. Heat sandwich 3 minutes per side, periodically pressing down on top of the sandwich with spatula.